Mallalieu M. 2013. 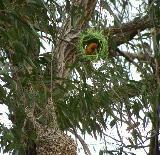 First records for South Sudan of African Cuckoo Hawk , Icterine Warbler and White-winged Widowbird . Bulletin of the African Bird Club 20(1): 71-74. Nikolaus (1987, Distribution atlas of Sudan's birds with notes on habitat and status) recorded the White-winged Widowbird as rare in the area now in South Sudan (along the border with Uganda) but he omitted this record in 1989 (Birds of South Sudan). In this paper the author records several sightings of male White-winged Widowbirds in breeding plumage, east of the White Nile at Juba, in July and August 2012. While the White-winged Widowbird is known from the Darfur region in Sudan, this appears to be the first confirmed record for South Sudan. Map: yellow shows distribution based on Nikolaus (1987) and red shows confirmed distribution (2012 sightings).